Went to an interesting talk by Ed Brandman, CIO of KKR & Co, the legendary Private Equity firm, hosted by CIO Perspectives in New York city. KKR is using a custom Business Intelligence solution, called Portfolio Central, to track and manage their portfolio of 62 companies. This portfolio includes some well-known companies like First Data, Toys R Us, Sungard, Dollar General, HCA and others. Some background on KKR first. KKR, led by Henry Kravis and George Roberts, is a global alternative asset manager with $60+ billion in Assets Under Management (AUM). KKR has been a leader in the private equity industry, having completed more than 175 private equity investments with a total transaction value in excess of $450 billion. KKR competes with Blackstone, Carlyle, Apollo and other large PE firms. With over 800 people, KKR conducts business through 14 offices on four continents, and has a pre-eminent global platform for sourcing transactions, raising capital and carrying out capital markets activities. How does KKR make money? As a global alternative asset manager, KKR earns management, monitoring, transaction and incentive fees for providing investment management, monitoring and other services to their funds, vehicles, managed accounts and portfolio companies, and KKR generates transaction-specific income from capital markets transactions. KKR earns additional investment income from investing their own capital alongside their investors and from the carried interest received from funds and other investment vehicles. So what is the BI and data analytics problem for Private Equity firms? There is a tremendous amount of data flowing from each portfolio company every month. The incoming data was diverse – balance sheets, income statements, cash flows, operating metrics, debt schedules, budgets vs. actual, segment data, month/quarterly/annual data points. The challenge for KKR was how to aggregate all this in-coming data to monitor trends, look for patterns and help make decisions. Every portfolio company had several analysts working to monitor the investment. These analysts often took 3-4 weeks to crunch the incoming data into a meaningful spreadsheet. The goal was to create a BI solution and automate some of the processing and cut it down to 3 days…a Portfolio Close problem. This helps give the analysts more time to move from number crunching to value creation. What does KKR’s Portfolio Central do? It took the 3-5 weeks analysis process and reduced it to a 3 day “crunch window”. 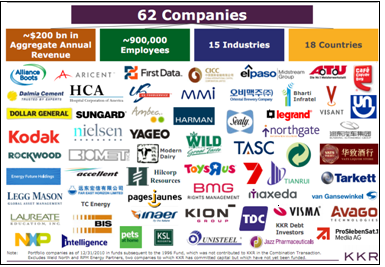 The BI platform allows them to generate macro-economic insights from the 65 companies and 9 segments to help understand market trends and dynamics. They can monitor events globally and track critical things like currency movements, raw material prices and impacts. The analytics framework allows them to manage credit. Credit is the foundation of private equity as most deals are done with borrowed money. So timing of debt refinancing – floating rate debt – is very critical. You don’t want to refinance debt in the middle of a crisis if you can avoid it. The analytics framework also helps with hedging strategies. They are expanding the tool to include more visualization. They are currently looking at Open Source Visualization tools for heat mapping and graphing. Apparently several people in the PE and Institutional money management firms have approached them about licensing this BI platform. They are also expanding the platform to Mezzanine, Special Situations, Distressed and Real Estate investment management.